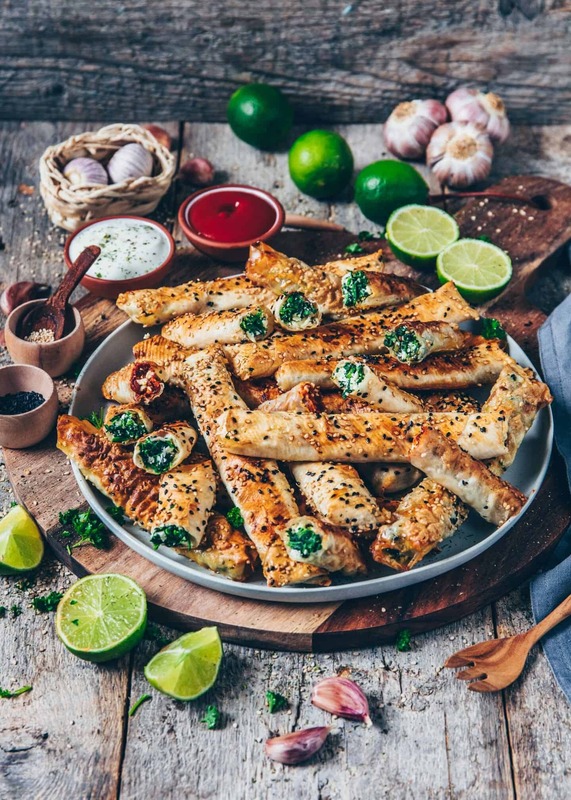 Are you familiar with Turkish Borek? They’re crispy stuffed pastries that are often served in Turkish cuisine and called “Sigara Böreği”. 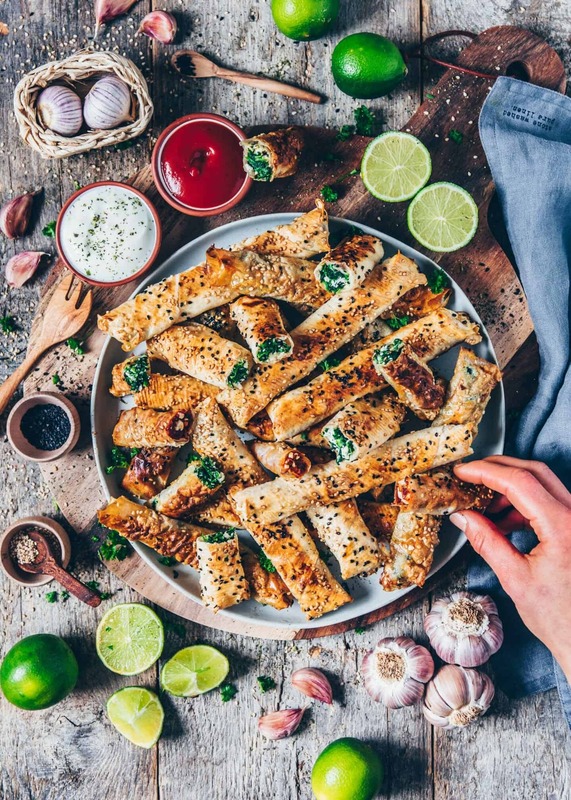 This oriental finger food is perfect for grabbing and dipping, and you can stuff them with different kinds of vegetable fillings. Anyways, one of the most popular fillings is spinach and feta (next to the classic onion and potato filling). 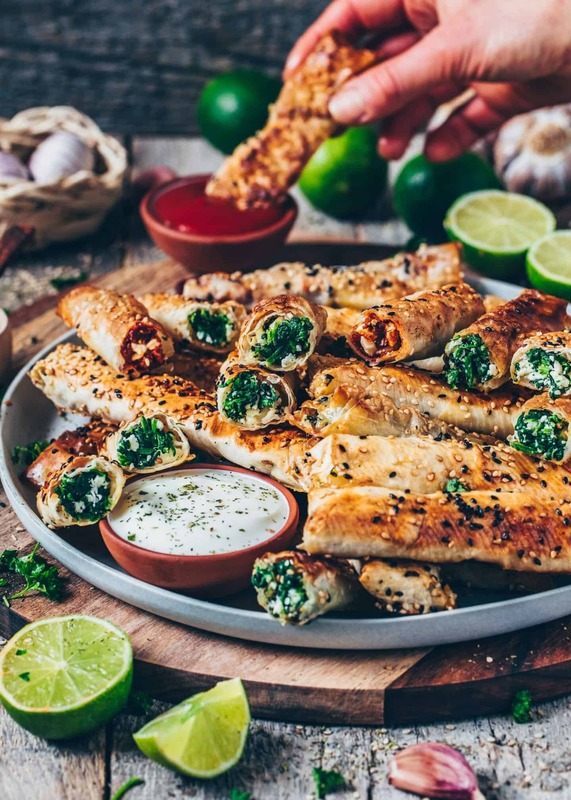 Usually, Turkish Borek is deep fried in a lot of oil, be that as it may, in my recipe they’re baked and not fried, which makes these Vegan Spinach Rolls much healthier! 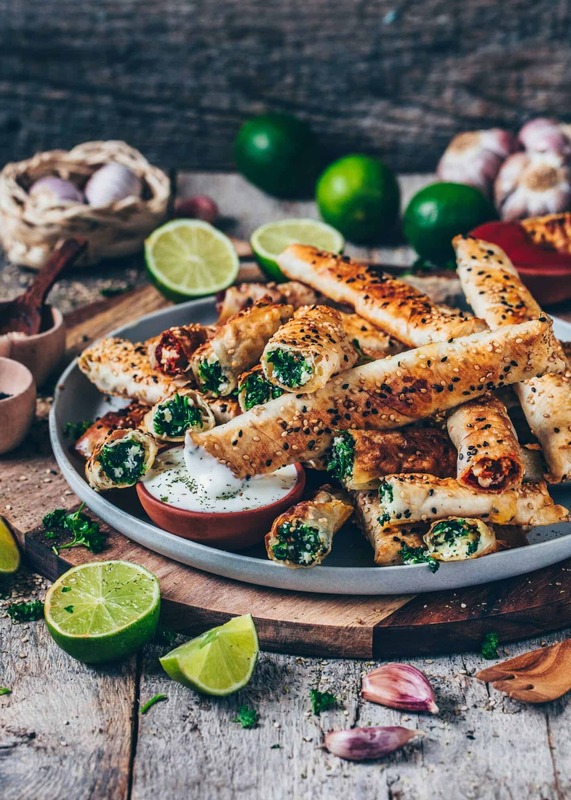 To be honest, Turkish Borek Cigars have always been one of our family’s all-time favorite snacks. My mom used to make them very often for the guests during our New Years celebrations. Of course, she always prepared a lot of these Spinach Rolls, because they are eaten much faster than you would expect! We prefer to serve different fillings because not everyone is a fan of Spinach and Feta. Spinach & Feta or Cashew & Tomato Filling? 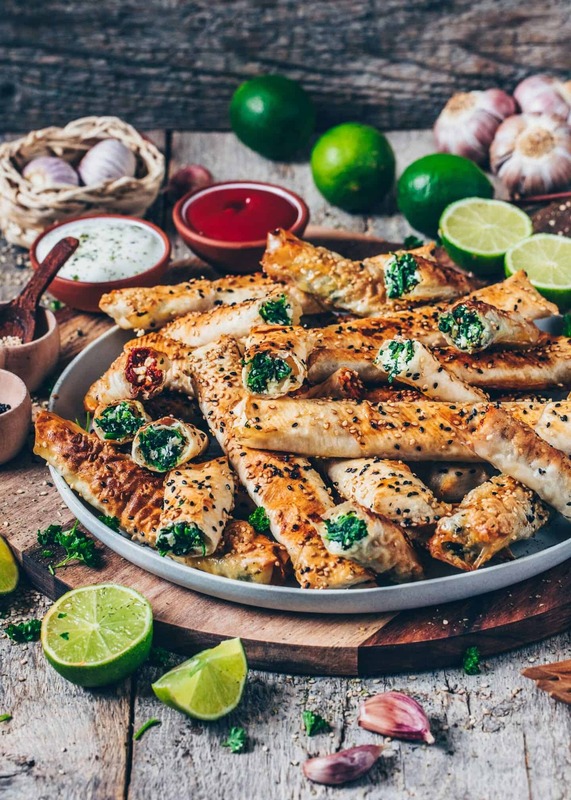 Have I already mentioned that these Turkish Borek can be made vegan very easily? 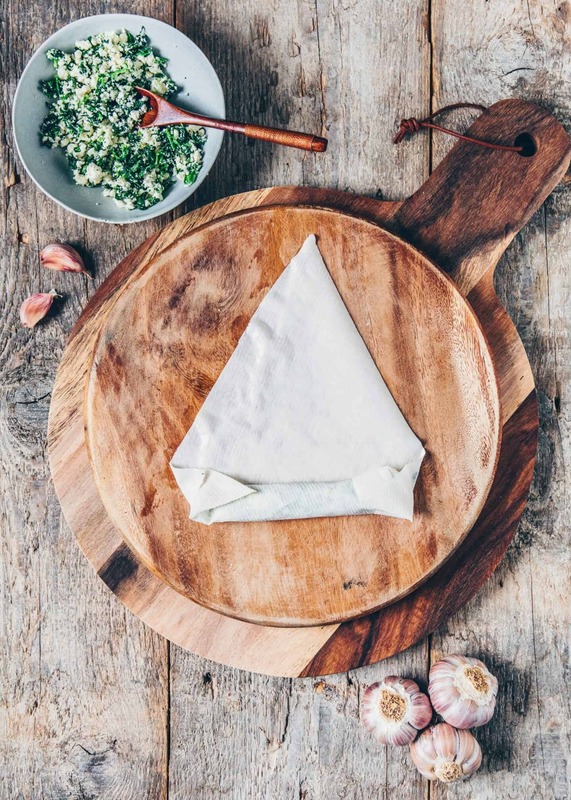 Instead of regular Feta, you can either use store-bought non-dairy Feta (“Feto“) or prepare your own cashew ricotta with the following recipe -> Homemade Cashew Ricotta. 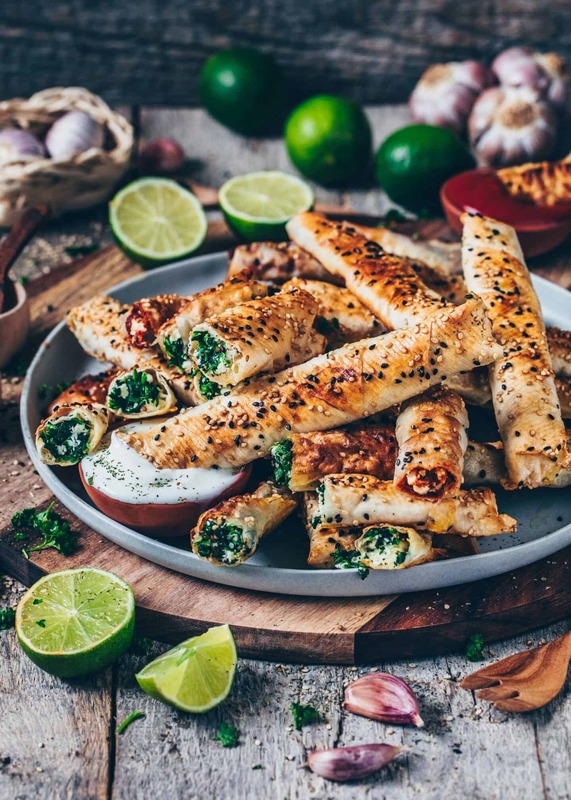 Anyways, in my opinion, the Spinach and Feta Filling is the best for Vegan Borek, but I also like the cashew tomato filling, which is made of tomato puree, sunflower seeds, and cashews. Both fillings are creamy, savory and spicy and taste absolutely delicious. However, you can stuff these Rolls with basically anything you like. Furthermore, a Mexican Filling with beans or my Pierogi Filling with mushrooms, a simple Pesto or Cashew Cheese are also great options. 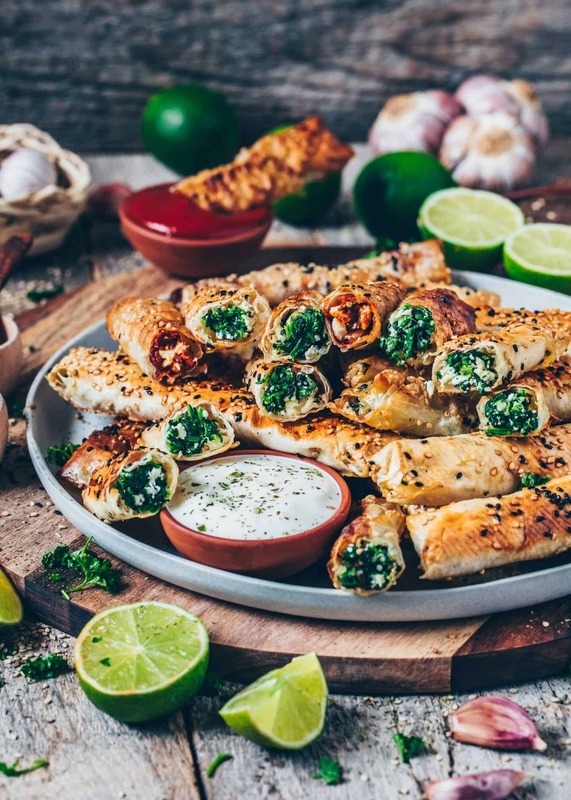 Turkish Borek (Vegan Spinach Rolls) are made with Yufka pastry sheets that are very thin pastries made of only water and flour. You can buy it in almost every supermarket (especially Turkish supermarkets) or order it online. 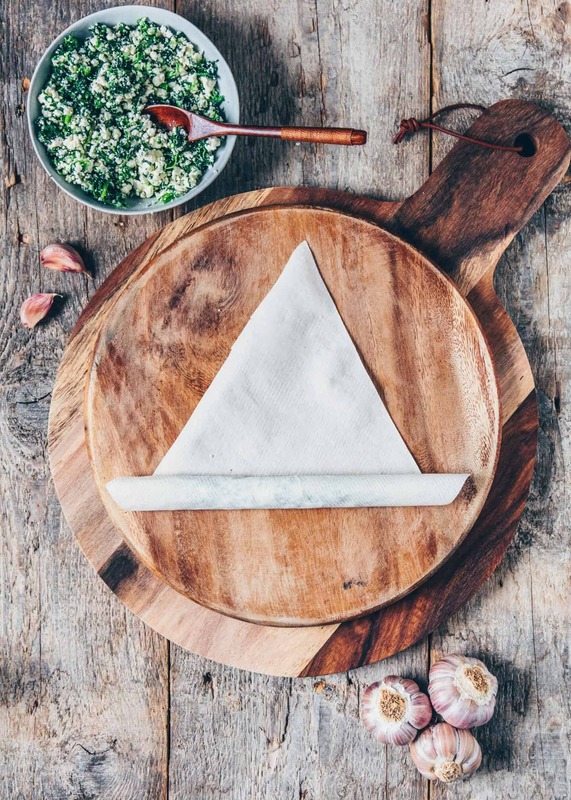 There are also triangular dough sheets available, which are perfect for making Borek Cigars. 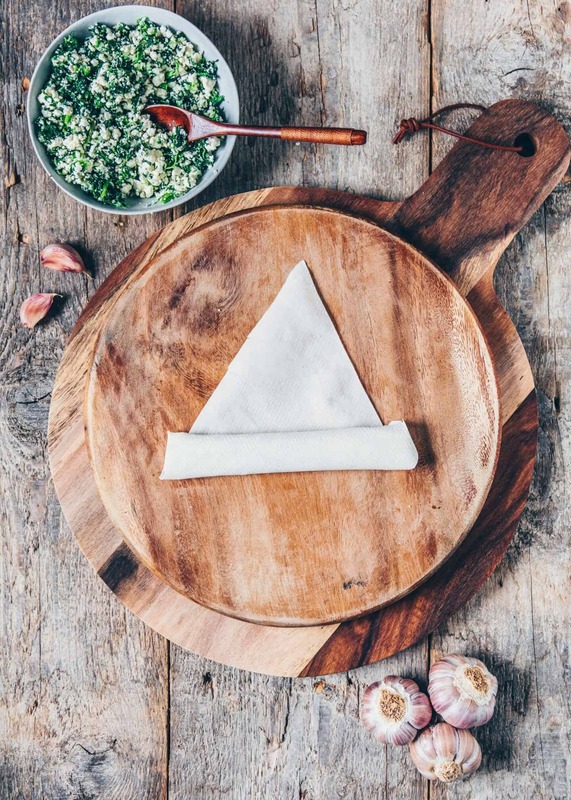 Of course, you can also cut regular Yufka dough into a triangle shape yourself. However, I think it’s easier to buy the ready-cut Pastry sheets because it makes the preparation much easier and you’re done faster! To make these Vegan Spinach Rolls, prepare the filling first (you can also make it ahead). Once the stuffing is ready, place approx. 1-2 tablespoons of the filling at the widest part of each pastry sheet. Then roll it tight to the top, also fold in the corners on the right and left to seal as you go, so the filling stays inside the wrap. 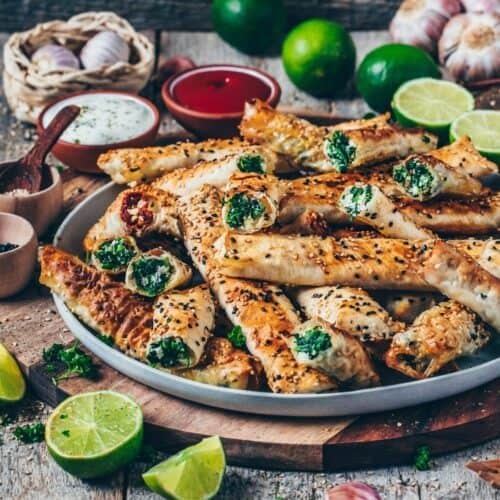 You can either shape these Vegan Spinach Rolls into Cigars, like I did or fold them into triangles like Samosas. The perfect snack for a party! A healthy Snack for any situations! 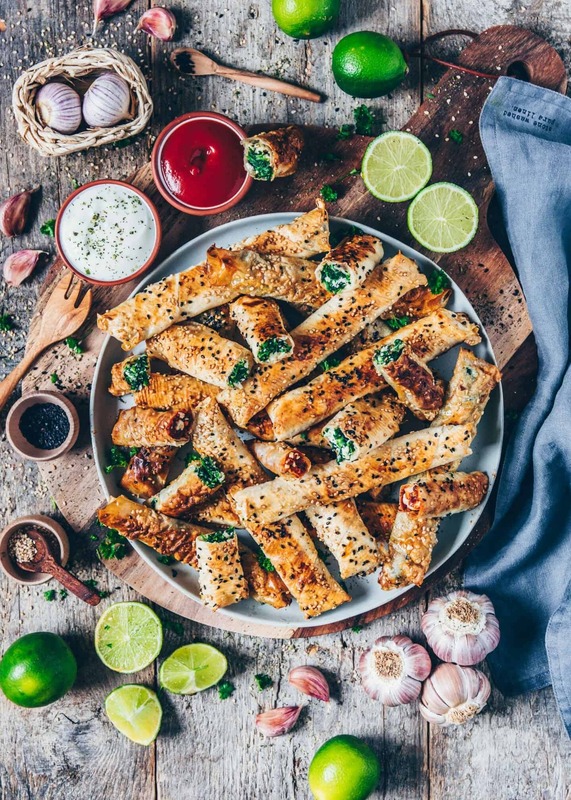 These Turkish Borek Cigars don’t have to only be served as a snack during the day for lunch or dinner, but also for breakfast. When I was a child I loved taking the leftovers to school the next day, so believe me, they’re also perfect as a snack to-go. You don’t need anything special to serve them with, but, we usually serve them with Cashew Dip or Vegan Aioli and Ketchup. 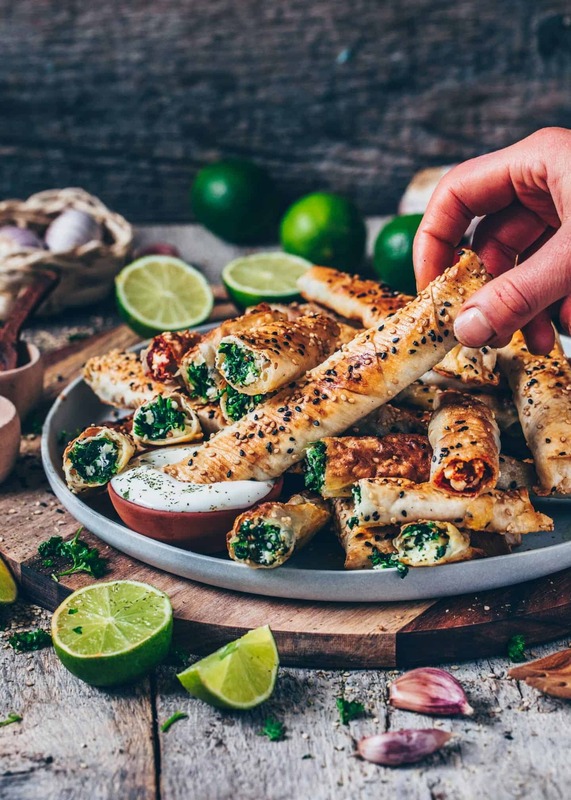 Crispy baked Turkish Borek (Vegan Spinach Rolls) is quick & easy to prepare and make great finger food! Serve to a party or just as a simple snack or side dish for dinner or lunch. Heat the oil in a pan and sauté the onion 1-2 minutes. Add the garlic and spinach and sauté 1-2 minutes longer until wilted. Let cool slightly and squeeze to remove excess liquid. (Optionally, use frozen spinach. Just thaw, squeeze and combine with roasted onions & garlic). Soak cashews and sunflower seeds in hot water for about 15 minutes, then rinse and drain. Put the soaked cashews and sunflower seeds along with the remaining ingredients for the tomato filling in a food processor and blend to combine. Season with salt, pepper, (nutritional yeast and Italian herbs) to taste. Place one triangle of yufka dough on a work surface with the longer edge facing you, and brush with the milk-oil mixture generously. Place 1-2 tablespoons of the filling near the wide end of the triangle, leaving about 1-inch (2cm) border on each side. Fold the long sides of the dough slightly over the filling. Fold in the sides to seal and roll up tight. Then place on a baking tray and repeat with the rest of the dough and filling. Brush the spinach rolls with the milk-oil mixture and sprinkle with sesame seeds. Bake in a preheated oven at 360°F (180°C) for about 15 minutes, or until golden brown and crispy. (Optionally, you can also go the traditional way and fry them crispy in a deep-fryer or in a pan with much oil). I prefer using triangular Yufka pastry sheets but you can also use regular Yufka dough (Filo dough) and cut into triangles using a pizza cutter. Make sure to cover the Yufka pastry with a damp dish towel during the preparation, so they won't dry out. I used this vegan feta, but you can also make Homemade Cashew Ricotta or Cashew Cheese, or use firm Tofu + 2 tbsp cashew butter or puréed pine nuts. You can freeze the filled rolls in a single layer on a platter, so they don’t stick together and won’t break when you want to remove them individually. What’s great is you can fry them straight from the freezer. It’s Cashew Dip. I linked the recipe in the text.